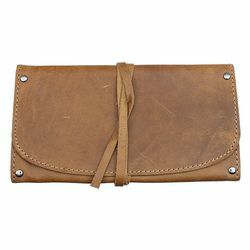 This one-pipe pouch is very similar in design to the Black Folding 1 Pipe Pouch you'll also find on our website: it's a roll-up design, inside of which you'll find two large pockets (one fitted flat, for tobacco, the other with some extra material, for your pipe), as well as three smaller pockets for pipe-cleaners and other accessories, with a long leather lanyard to provide a simple means of keeping everything securely closed. 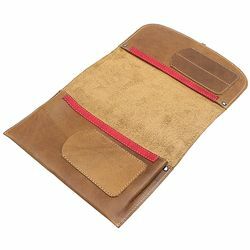 There is a notable difference however in that the antique-finish leather of this pouch is considerably thicker. Measurement 7.05" x 3.85" folded. I think this is perfect. It’s very well built and I couldn’t imagine needing much more if your on a one pipe day trip. The tobacco section of the pouch is not lined but I preffer this personally. I’ve been using mine for a year now and it’s sturdy, rustic and a great price. Fits everything I need and smells of beautiful leather. I’m thinking of buying another one for the future. Honestly I did not like at at first. After applying several treatments of leather conditioner, It turned out quite nicely.